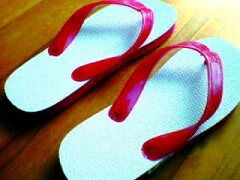 Shima sandals – there is constant demand of “shima” sandals throughout the year in Okinawa compared to mainland Japan. The annual sales in Okinawa alone are over a million pairs. Before World War II, the sandals were made from adanya leaves that were woven. After the war from 1945 to about1958, tires from U.S. military vehicles were used, melted and molded into shape. Then began manufacturing of the new type of Shima sandals that are the favorites of locals and tourists to this day.